Are you a Tarot reader wanting to ride the Petit Lenormand wave but not sure how to navigate these two very different card systems? Who better to learn from than internationally renowned Tarot author, reader and teacher, Mary K. Greer who confesses to giving herself over to a ‘complete Lenormand obsession’ in recent years! Mary’s course on reading the Petit Lenormand cards received rave reviews from people who were in the recording sessions and those who have subsequently bought the recordings. 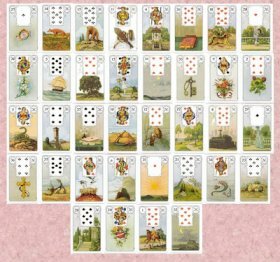 Originating in the 18th century and valued for generations in Europe, the Petit Lenormand deck is undergoing a huge Renaissance in English-speaking countries with over 50 new decks published since 2011. Part of this intense interest lies in one’s ability to quickly learn to answer specific, concrete questions about everyday life using simple but evocative images that even a three-year old can recognize. Interest is sustained in that the traditional system provides richness, depth and complexity that can take years to master. Lenormand readings are far more succinct, accurate and practical than Tarot. Learn how to anticipate problems and opportunities, describe people and events, compare alternatives, predict outcomes, and even find lost objects. Starting right away with the traditional Grand Tableau (or “Big Picture”) that uses all the cards, Mary de-mystifies it by exploring its basic components, breaking it down into easy-to-understand shorter layouts. You’ll discover the secret of interpreting Lenormand through pairs and combinations, the kinds of questions that can serve you best, and how to use the playing card inserts found in most decks. Start reading these amazing cards immediately. The Grand Tableau – its elements and how to read them, e.g. pairing, three cards, knighting, the square of nine, the houses. “I cannot overstate how superb this experience has been for me! Thank you Mary and Linda, I am so delighted with the results! Before I enrolled I was feeling overwhelmed and weary on my Lenormand journey. I often felt that I was desperately treading water when it came to understanding and practically applying Lenormand. During Mary’s course I suddenly found a solid footing. Her style of teaching and the methodical manner in which she presented every lesson, along with the powerful homework assignments given to us was exactly what I needed to solidify everything I had learnt. Highly recommended! Five stars on all fronts – presentation, clarity, professionalism and engagement. Thank you!”… JbR, Australia, 2013. “At Readers Studio 2013 I was introduced to Lenormand by Rana George and loved it from the onset. I ordered so many books on Lenormand from Amazon and really didn’t have the time to read them all. I registered for this course and now l feel so confident with my Lenormand readings. I learnt so much in such a short time. I felt like Mary Greer was in my living room teaching me. It always felt hands on even though I was miles away. Mary, thank you so much for everything you have taught me. You can tell your teaching comes straight from the heart.”…DM, Canada, 2013. The video recordings of the five classes are available as MP4 files (with the exception of one class which is a Windows Media file). They can be viewed on PCs using Windows Media Player and on Macs using the free VLC multimedia player for Mac operating systems which can be downloaded here. 5 classes and handouts stored on a USB flash drive: $160 + airmail postage added at the checkout.